The Shar Pei breed comes from the Guangdong province of China. 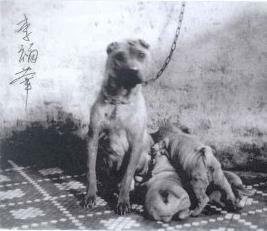 The original Shar-Pei from China looked very different from the breed now popular in the West. 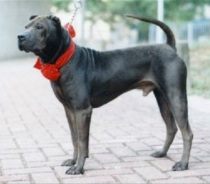 People in southern China, Hong Kong, and Macau differentiate the Western type and the original type by calling them respectively 'meat-mouth' and 'bone-mouth' Shar-Pei. The ancestry of the Shar-Pei is uncertain. It may be a descendant of the Chow Chow; however, the only clear link between these is the blue-black tongue. However, pictures on pottery suggest the breed was present even in the Han Dynasty (206 BCE). A statue on display at the Boston Museum of Fine Arts dating from the second century C.E. depicts a dog that strongly resembles a modern Shar Pei. For many years, the Shar-Pei was kept as a general-purpose farm dog in the Chinese countryside, used for hunting, protecting and herding stock and guarding the home and family. During that time, the Shar-Pei was bred for intelligence, strength and scowling face. Recent genetic research has suggested the Shar-Pei is one of a few ancient dog breeds, believed to have split from common ancestors earlier than other breeds. By mapping subtle differences in each breed’s genes, searching for patterns of relationships and designing a tree to fit them, they could finally gain insight into this marvel of evolutionary engineering. In 2004, the foundational analysis of purebred dog genetics was published in Science. The resulting tree was profoundly asymmetrical. After wolves, just four groups sat its base: Asia’s shar-pei, along with shiba inu, akita and chow chow; central Africa’s basenji; malamutes from the Arctic, along with Siberian huskies and samoyeds; and from the Middle East, Afghan hounds and salukis. Later, it was used for dog fighting. The loose skin and extremely prickly coat were developed originally to help the Shar Pei fend off wild boar, as they were used to hunt. Dog fighters used these enhanced traits to make the Shar-Pei difficult for its opponent to grab and hold on to, and so that if it did manage to hold on, the Shar-Pei would still have room to maneuver and bite back. The Shar-Pei's most intriguing feature, in this respect, is that if one grabs them by any loose wrinkle, they can actually twist in their skin and face in one's direction. This trait was used in fighting as a means for them to fight back; they would be bitten and twist in their skin to bite back at the offender. During the Communist Revolution, when the Shar Pei population dwindled dramatically, dogs were rescued by a Hong Kong businessman named Matgo Law, who appealed to Americans in 1973 through a dog magazine to save the breed. Around 200 Shar-Peis were smuggled into America. The current American Shar Pei population stems mainly from these original 200. DNA analysis has concluded that the Shar Pei is one of the most ancient dog breeds.